Knit By God's Hand: Prowling around me? YIKES! We are into week 2 of our study... & I'm already feeling so much info being fed into my heart with the book, with the words of others on the site, & taking steps to try & APPLY what I'm learning. *... because he cares for you. .... Come on. Isn't that comforting? Something we all need to be reminded of? I don't think I want to go through any day in my life & not feel like I'm not cared for. * My version (niv) says "Be self-controlled & alert".... that version really speaks to me. That's what this whole study is about for me. Being self-controlled. What that looks like. I've been there before. Its why I was a single digit dress size on my wedding day. I guess as you get older, you forget. I need to get that self control back. Alert, as well. I mean, I needed alarms to go off when I felt my pants getting tighter. But I waited until I couldn't breath before I even really noticed. Not so much on the alert side. & wait - the devil wants to do that to me? Yeah... my enemy, for sure. The other thing that always makes me think - the Bible refers to Jesus as the Lion many times... so I'm now knowing WHY I have to be alert... because we don't want our sneaky enemy to disguise himself as our friend who is Jesus... he's very sneaky like that. Stopping by from the P31 Blog Hop! I hope you have a great Week 3!! Great Blog! love all the graphics to go with the verse! brings it to life! love the boy meets world GIF!!! 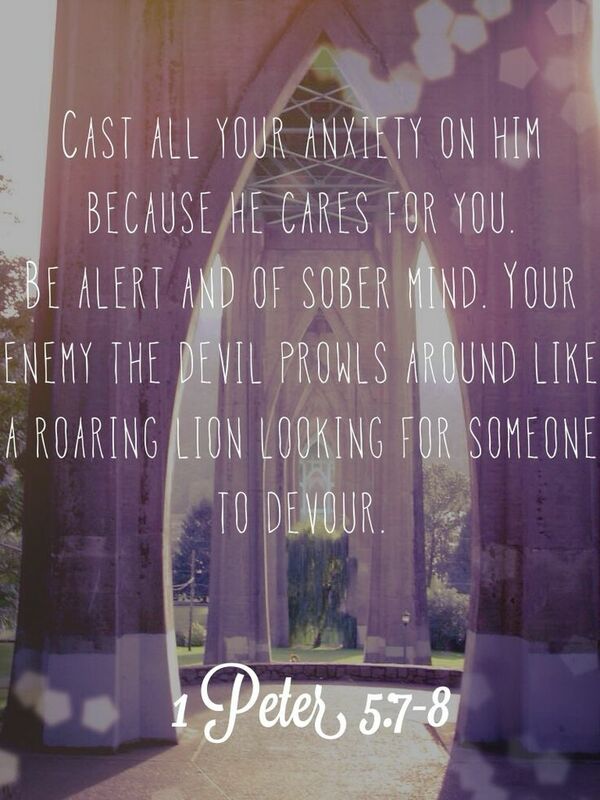 and the point you make that anxiety is anxiety - to cast it ALL on Him. i love that reminder because sometimes i think some anxiety is too silly to cast on Him...but it's not! So glad our God is so much stronger than the devil!